Health risks make up over half of parents’ concerns about taking babies swimming in public pools, according to survey findings. Fear that the baby might pick up a bug was voiced by a quarter of respondents (25.5%), while a further 22.7% were worried that chlorine would irritate the infant’s skin. 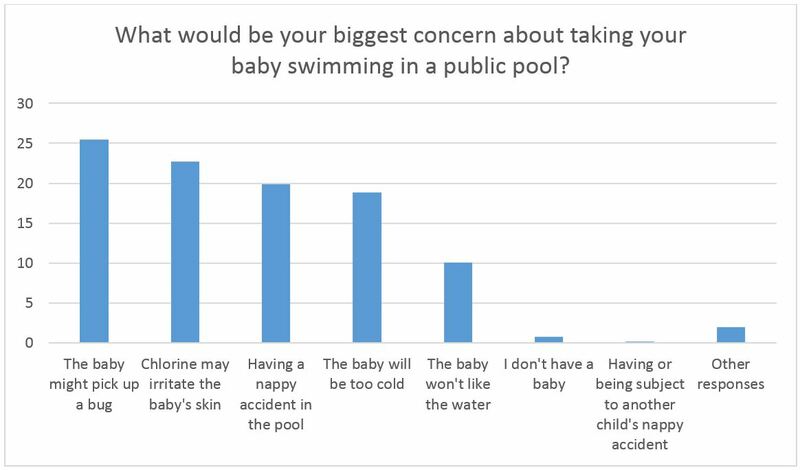 Having to deal with a nappy accident in the pool was the third biggest concern, with a fifth of parents’ votes, while others were put off by the prospect that their baby would be too cold (18.8%) or wouldn’t like the water (10.1%). The findings come despite evidence documenting the benefits of introducing children to swimming at an early age. These include promoting parent-baby bonding, building infants’ coordination and motor skills and enhancing their wellbeing. And further research has found that early years swimming could even improve children’s capacity to learn mathematics. But the use of the internet — and particularly searching around health concerns — could be exacerbating people’s anxieties, studies suggest. Bernadette Spofforth, managing director at Splash About, which conducted the survey, said: “Having concerns about taking your baby swimming in a public pool is perfectly understandable, but the benefits to children’s development are well documented. The introduction of specialist swim nappies in lessons 15 years ago created a safer swimming environment for all pool users. And since 2016, when it became industry best practice for babies to wear a neoprene over-nappy in all lessons, over 90% of swim schools have mandated this standard. This product prevents solids from leaking into pools and therefore helps to mitigate the risk of ill-health through stomach bugs, both for babies and other swimmers. The data was gathered in April 2018 via an online survey of 1,000 members of the UK public.